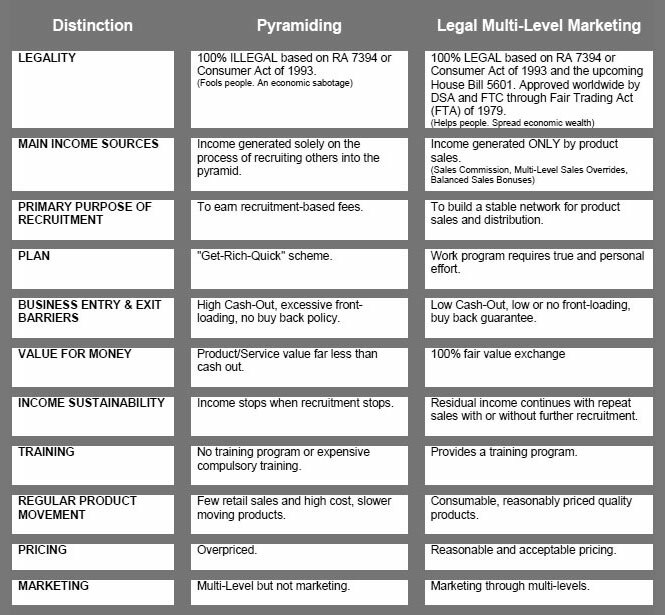 Network Marketing or Multi-Level Marketing (MLM) is a natural business. Actually, you are involved in some form of MLM everyday. When you watched a good movie you tend to tell it to your friends who in turn will watch it also and eventually, will do the same thing as you did. It’s also true when a new restaurant opens, when a new product is introduced in the market, or when you recommend a familiar medicine to an ill neighbor. That is what MLM concept is all about. It is simply sharing a good product, service or business opportunity with others. We are doing that all the time. MLM is perhaps the purest form of free enterprise. The “Fair Trading Act of 1979” of FTC that became the basis of all MLM laws today. But be careful also because many Pyramiding Companies are disguising as MLM. The product has nothing do with legitimacy. The legitimacy is in the compensation plan. A lot of companies who are members of both agencies were closed down for pyramiding. The fact is that growth, profits and lack of debts may be signs of involving in pyramiding. Length of operation has nothing to do with legality. Lack of regulation is. The best thing to do is to learn the difference between legitimate MLM and illegitimate pyramid. NETWORKING IS NOT PYRAMIDING! This must be emphasized because pyramiding is illegal. The essential difference is in the system of commission. Network or Multi-Level Marketing (MLM) systems pay commission on the sale of products. Pyramid systems offer distributors commission for recruitment of new entrants not on the product sales of sponsored parties. The danger with such Pyramiding schemes is 1) they are illegal and 2) there is the risk of collapse. The Pyramid system crashes when there are no more recruits. This means financial loss for all distributors. This is the reason why most countries in the world outlaw this practice.